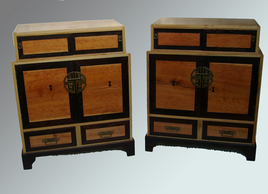 The cabinets are made of Oak case Cherry doors and Wenge trim. The hardware is an Oriental brass design. 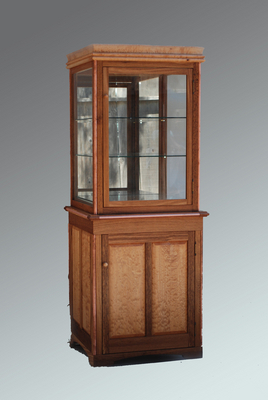 The cabinet features an upper glass shelved display lighted from the top. The panels in doors and sides and drawer fronts are Sycamore taken from a wind felled tree by an arborist who then milled and dried locally. 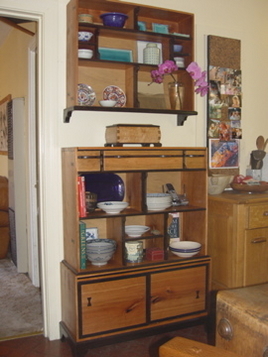 Two piece dish shelf with drawers and sliding doors at bottom. This piece is made of Cherry and Wenge. This commission was made of oak and maple. The oak was stained a deep red Mahogany. The blanket chest is used as a bench as well. The case features sliding top doors and dove tailed case joints. This display case is custom made for Jeweler to house materials and tools and show off current pieces. This saltwater aquarium has all its water cycling system installed inside the cabinet and plumbed up through the top. It is made of Cherry and figured maple. This custom design was created to show the negative space as an element of the piece. The half circle is made of four 1/4"x 6" resawn strips laminated around a form. This house was recently remodeled and the case and mantel was made from redwood siding taken out of this same room. Two of these were designed to compliment the center cabinet shown photo below. The client was running out of space for her antiques. The two tall replicas got filled up fast. 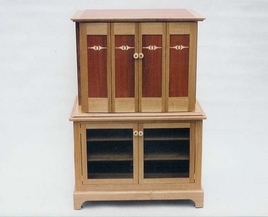 This cabinet is used as an end table and storage in a kitchen nook. 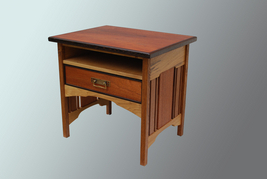 It is made of Mahogany, Lacewood, Oak and accented with Wenge. The cabinet houses audio and video components and the screen is mounted on the wall behind ,not shown.